Enjoy Utah! : FREE Disney On Ice Tickets! FREE Disney On Ice Tickets! Invite the Public to Celebrate and Help the Utah Food Bank! Come down and watch Michelle from Enjoy Utah! face off against Big Buddah! Local Mom Bloggers (including Michelle from Enjoy Utah!) will face off in a Utah Food Bank Let's Wrap this up event, competing against each other in wrapping up food items collected during the Drive. Timed events will include, fastest gift wrapping, prettiest gift wrapping, most unique gift wrapping, in addition to other events. Audiences are invited to make an ordinary day extraordinary and enjoy some of the world's most popular festivities with Mickey Mouse and Minnie Mouse, including a Very Merry Unbirthday Party with Alice and the Mad Hatter; a Mardi Gras parade with Princess Tiana and Prince Naveen; a Hawaiian luau with Lilo and Stitch; a winter wonderland with everyone's favorite toys - Woody, Jessie & Buzz Lightyear; a Halloween haunt with the Disney Villains; a Valentine's Day Royal Ball with the Disney Princesses...and more in the celebration of the century! 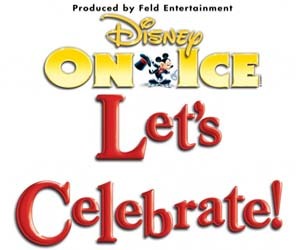 Disney On Ice presents Let's Celebrate! features more than 50 characters from 16 Disney stories live on ice, including Tiana, the newest Disney Princess from Walt Disney Pictures' The Princess and the Frog. Ticket prices for Disney On Ice presents Let's Celebrate! range from $13, $17, $23, $40 (VIP) and $52 (Front Row) - prices do not include service charges, handling or facility fees. Tickets are available from the EnergySolutions Box Office and all SmithTix locations, via phone by calling (801) 355-SEAT or (800) 888-TIXX and online at http://www.energysolutionsarena.com/ or http://www.smithstix.com/. To learn more about Disney On Ice, go to http://www.disneyonice.com/, or visit us on Facebook and YouTube. While there, enter to win VIP Meet And Greet Passes for opening night! More ways to enter to win tickets with Enjoy Utah! Utah Food Bank provides food to a statewide network of 150 emergency food pantries and agencies statewide. Last fiscal year, Utah Food Bank distributed 30.8 million pounds of food, the equivalent of over 24 million meals for families and individuals in need. Utah Food Bank also served 221,237 Kids Cafe meals, delivered 26,472 senior food boxes and answered 114,994 phone calls through 2-1-1 Information & Referral. For more information about Utah Food Bank call (801) 978-2452 or visit www.UtahFoodBank.org. Find us on Facebook at www.facebook.com/UtahFoodBank and on Twitter at www.twitter.com/UtahFoodBank. You know I am looking forward to the giveaway!! !